Preheat oven to 350 degrees. Ceam butter, sugar and vanilla to a paste. Keep stirring and gradually add the egg whites. Continue to add the flour in small batches and stir to achieve a homogeneous and smooth batter/paste. Cover the bowl with plastic wrap and chill in the fridge for at least 30 minutes to firm up. (This batter will keep in the fridge for up to a week, take it out 30 minutes before you plan to use it). Line a baking sheet with parchment paper and chill it in the fridge for at least 15 minutes. Pipe the batter onto the baking sheet in thin circles, about 2 inches in diameter. Bake the tuiles for about 8-10 minutes or until the edges turn golden brown. Immediately release from bakingsheet and press the tuiles into a mini muffin tin to form baskets. These cookies have to be shaped when still warm. Allow to cool in the muffin tin. Whip together the peanut butter, sugar and 1/4 cup of the heavy cream, until the mixture is lightened in color and somewhat thick. Gradually whip in the rest of the cream, a little at a time, until the mixture is uniform, and will hold a peak when the beaters are removed. 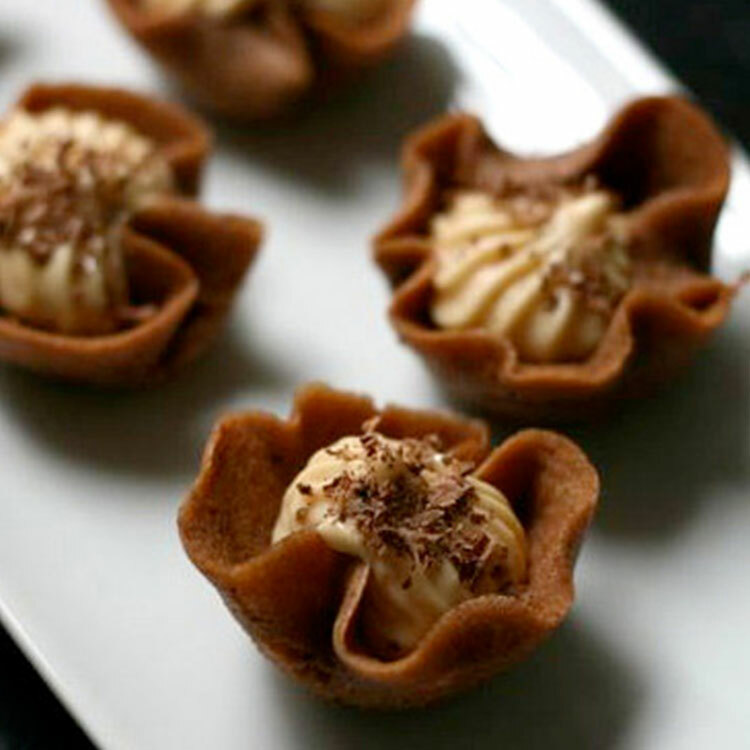 Pipe the mousse into the cooled tuile shells, and garnish with chocolate shavings. Serve at room temperature or chilled. Copyright © Wippy 2018. All Rights Reserved.